I know Clarkson hasn’t got a clue, Yabuku is a fat lump and the sooner Alan Federici goes back home the better. I know we didn’t have a forward who could shoot but at least Oliver Morewood got it right when he said we had to stop winning on Saturdays and losing on Tuesdays. Hurr hurr, we sorted that problem out. Simon Cox is as effective as my dimwit son Charlie, who thankfully cleared off today and wasn’t offering his waffling, driveling, tuneless songs and halfwitted advice. No, with all these games on Tuesdays and Saturdays I can’t keep up. So it’s up to me to up my game and give the manager my advice a bit more often. And I need to educate you lot coz you know nothing about football. On Tuesday we gotta stop Alfie Le Fondre. Never mind the rest they are nobodies. One nil to us and everyone can stop moaning. You lot do too much of that. Then we’ll beat Bradford easily. Then Arsenal in the semi final and bon nuit Vienna coz we’ll lose about five nil to them. And that’s coz we’re a useless, boring team of rubbish players. Sort it out Majeski. IS ISLAMIC STATE IN RETREAT ? This briefing looks at two unrelated incidents in the first weeks of 2015, in France and Syria, as indicative of major developments in the evolution of extreme Jihadist movements and that are likely to have long term effects. The Charlie Hebdo murders will lead to much more intensive counter-terror procedures in France and in greater security services cooperation across Europe but these also risk stimulating a further rise in the anti-Islamic mood. 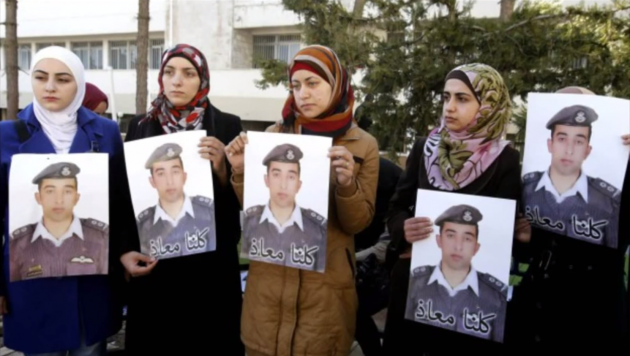 The execution of the young Jordanian pilot, Flight Lieutenant Moaz al-Kasasbeh by Islamic State (IS) in Syria looked initially to increase the resolve of regional states to confront IS. However, it is far from clear that recent suggestions that IS is more generally on the defensive are accurate. On 7 January, two French brothers of Algerian descent, Saïd and Chérif Kouachi, entered the central Paris offices of the French satirical magazine Charlie Hebdo and opened fire on an editorial meeting, killing 12 people. In an apparently coordinated attack, hostages were later held at a Parisian kosher supermarket. Four customers and another police officer were killed by Amedy Coulibaly, an apparent associate of the Kouachi brothers. By the time the three attackers were killed in sieges on 9 January, France had deployed an estimated 80,000 police, army and other security personnel in response. Although Charlie Hebdo was a low circulation magazine, it was a part of French political culture and represented that strand, more prominent in France than in most European countries, of vigorous political lampooning, sometimes close to the obscene. The attack was viewed immediately as an assault on freedom of expression and the response included the biggest public demonstrations of support on any issue in France for decades and stoked intense debates across Europe on what is and is not permissible. One element of the attack is to point to how actions by determined individuals can have a huge influence depending on the targets and the timing. Those directly involved were just three people. They appear to have been well equipped and to have had paramilitary combat training, with at least one of them spending time with an offshoot of the al-Qaida movement in Yemen, and there was in all probability a small support group, some of whom may have been aware of the detail of what was planned. Even so, two people with one specific target and another with a more generic intention, were able to dominate the security agenda of a major western country for three days with the mobilisation of over 80,000 security personnel, and to have a major effect on the world-wide media. What was largely ignored was the deep and structured alienation and deprivation that formed the backstory for the attackers’ turn to the politics of violent and conspiratorial jihadism, in Coulibaly’s case via petty criminality. They share this backstory with many others perpetrating similar attacks on civilians in western countries in recent years. What was also relevant was that the Charlie Hebdo attack was not specifically linked to IS, widely seen as the major issue for European states. Confusingly, Coulibaly had claimed allegiance to the IS in a previously recorded video message and his alleged accomplice, Hayat Boumeddienne, is believed to have fled France for IS-controlled Syria. The Kouachi connection was more strongly with the Yemen-based al-Qaida in the Arabian Peninsula (AQAP), a reminder that Islamist and jihadist groups exist in a variety of configurations beyond IS and that links between such competing factions and their supporters are often nebulous and far more defined by the individual’s imagination than by inter-institutional alliances. The manner of the execution of the young Jordanian pilot, Flt Lt al-Kasasbeh, led to vigorous condemnation across the Middle East and beyond, with immediate suggestions that IS had greatly damaged its standing. It was an analysis reinforced by the clear indication that this was not a sudden decision but part of a closely scripted action, most likely done some weeks before the release of a lengthy and professionally produced video of the murder. The initial response from Jordan was very heavy condemnation from King Abdullah and senior government officials that reflected opinion across much of the Kingdom, even though there were still indications of unease among a substantial section of the population that had been unhappy about Jordan’s participation in the war. One other coalition partner, the United Arab Emirates (UAE), had contributed strike aircraft until December but then withdrew after the capture of Flt Lt al-Kasasbeh, citing fears for its own aircrew. In the wake of the execution the UAE was under heavy pressure to renew its commitment to the coalition and in early January it did so, reportedly deploying an F-16 squadron to Jordan. Meanwhile, Jordan substantially increased its role in the bombing attacks on IS, primarily in Syria and aimed especially at the IS. IS sources subsequently claimed without clear evidence that one attack had killed their one remaining American hostage, the young aid worker Kayla Mueller, who had been detained in Syria eighteen months earlier. IS’s action had multiple purposes. One was to act as a threat to all Jordanian aircrew – if they are captured, a similar fate will await them. To drive home this threat, IS released the names and addresses of other Jordanian pilots involved in air attacks in the video showing his execution. A second was to spread dissension and division within Jordan. A third was to extend the sense of threat to all aircrew in the coalition, including pilots and other aircrew from the United States, UK, Canada, Australia, Netherlands, Belgium, France and Denmark. This threat also extended by inference to any ground troops that might be taken hostage, including forward-based Special Forces and the increasing numbers of troops involved in training Iraqi Army personnel in Iraq and Kurdish and rebel militias in Turkey. The reactions from Jordan and the UAE suggested that the killing of Flt Lt al-Kasasbeh had had the opposite effect to that intended, but there have been other indications of considerable political concern among western governments at the prospect of their military personnel suffering a similar death. Late last year the UK announced it was expanding its training commitment to the Iraqi Army by establishing a battalion-sized force with 200 trainers and several hundred supporting personnel, including a substantial protection force. In spite of the size of the protection force, the National Security Council postponed implementing the decision following the capture of Flt Lt al-Kasasbeh, reportedly on the grounds that the government feared the public impact of the capture or killing of UK military personnel in the run-up to the May general election. 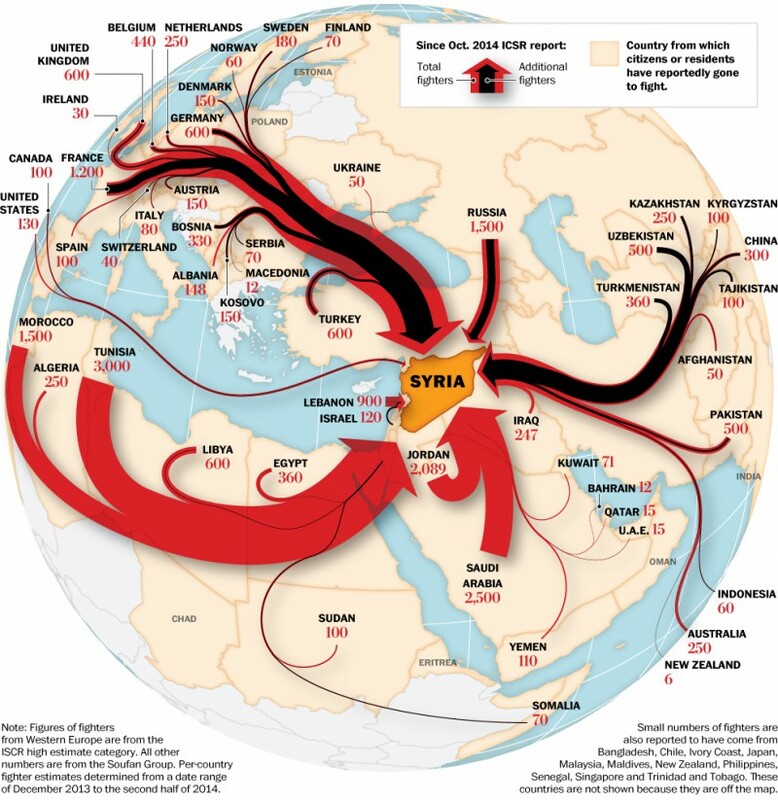 In both Syria and Iraq, the war with IS expanded further in December and January and one of the most significant developments was the increase in direct combat between IS paramilitaries and western troops. Contrary to the repeated statements from heads of government that such troops would not be involved directly in ground combat, there were clear indications that this was happening, including reliable reports that Canadian Special Forces had engaged in three fire-fights with Islamist paramilitaries during January. After the killing of the Jordanian pilot, there were indications of some setbacks for IS in Syria, some taking of territory from them in Iraq and even some indications of declining morale. The US Secretary of State, John Kerry, argued on 8 February that the coalition was now “on the road” to defeating the movement, a notably upbeat assessment compared with assessments at the end of 2014. In that sense, the further development of IS, in the face of some difficulties in Syria and Iraq, will depend on its level of support in the wider region, not just across the Middle East and North Africa but in a number of western countries. Judging by the reaction to the Charlie Hebdo attacks, counter-terrorism forces in Europe are fully aware of this, but the problem is that any substantial increase of action which can be seen as heightening suspicion of Muslim communities risks exacerbating social alienation, especially for young disaffected men and women. For all the current talk of threats from ‘foreign fighters’ returning from territory uncontrolled by any recognised government, politicians continue to miss the point that radicalisation increasingly happens at home and in response to their own internal and foreign policies. Leaving to fight abroad with IS or al-Qaida is far less a cause of radicalisation than its consequence. While IS has suffered some reversals, its core challenge remains the same and it has recently had further extreme Islamist factions pledge allegiance, including in Libya, Egypt, Philippines and Afghanistan. It is believed to be still attracting many hundreds of recruits every month from across the region and beyond. Perhaps of greatest concern is that if there are increasing tensions in communities in Western Europe, not least France, then the political and security response will exacerbate marginalisation among vulnerable groups. In that respect, the aftermath of the Charlie Hebdo attack, though having little or no connection with IS, may have a significance that is currently being missed. Author: Paul Rogers is Global Security Consultant to Oxford Research Group and Professor of Peace Studies at the University of Bradford. His Monthly Global Security Briefings are available from their website or via their monthly newsletter. If you’re campaigning for social justice, animal rights or to protect the environment or part of a leftwing group, then it’s likely you’re already on a police database and classified as a “domestic extremist”. As previously mentioned, this term is deliberately vague and can be applied to anyone who’s challenging the existing order and wants to build a fairer, more just and compassionate society. According to the Network for Police Monitoring – Netpol – “secret police databases may hold information on up to 9000 people, many with no criminal records, although the number could be far greater.” The group is suggesting people find out what information is held on them by making a subject access request under the Data Protection Act. Why bother? Netpol say “if you discover inaccuracies or trivial information in any data that the police hold, we would like to work with you, in confidence, to expose this.” So basically it’s about shining a light up to the secret state, exposing and discrediting it. Some would argue this is irrelevant to the struggle for building a free, liberated world. I can see their point to some extent. It’s easy to become obsessively paranoid and then end up doing the state’s job for as we close ourselves off to the rest of society by being insular and conspiratorial. Nevertheless with the revelations of recent years over state/corporate spying and surveillance, we have to recognise the extent to which we can be targeted. Or as someone once put it to me: “We had no idea we were as important as they thought we were”. WARNING – a little off topic, but tangentially related. Can someone tell me, still very much a tech noob, what the significance is of the term “lion” or names containing “Lee” or “Leo” (including homophones like “Leigh” or parts of names (“Cleo,” as a made up example)). In my sleuthing, I’m seeing an uncanny amount of usernames w/ Lee, Leo, etc. in the twitter followers (and other social media) of some of the most unscrupulous appearing individuals in digital currency. IMHO, this is not a coincidence (maybe it is, maybe its a figment of my imagination), but I haven’t been interested tech/computers in a substantial way but for a year and half or so and lack some of the foundational knowledge to know what’s going on. Very interested to read what others think and whether there is something to this. EDIT – Very aware of seeing patterns where none may exist . . . . I just don’t see the Lee/Lion thing in other areas, just tech/digital currency/[possible] scammers. I also posted a tongue-in-cheek (but still serious) thread on Reddit about a week and half ago about ISIS’ use of internet memes to recruit young girls. Possible evidence of this playing out has been in the news recently with reports about three young girls leaving the UK for Syria to join up in ISIS. Recently, there have been several news reports about ISIS using bitcoin for fundraising and money transmission purposes. We learned a few days ago that Jihadi John (of ISIS ilk) is a well-to-do young Londoner with a computer science degree. From his picture, he looks like he could be any young, modern individual and not a fanatical, ostrich-mimicking bozo that destroys historical artifacts in Mosul that date back to the time of Abraham. On February 6, 2015, a man from Utica, NY was arrested in Indiana for suspected ties to ISIS. The gentleman, like John in the previous paragraph, appears to look like he could be anybody. His arrest came after he and few others had been watched for two years by law enforcement. During that period, and though September 2014, Mr. Rosic and others, both males and females, allegedly sent funds and supplies to third parties with the intent of supporting ISIS and its affiliates. The amounts were not exactly large either: $300 here, $1500 there, ete. – more or less the cost of a bitcoin depending on the date. Admittedly, this post appears a little paranoid and spastic. However, I’ve now found some confirmation of a communication strategy I believe I see from time to time in the digital currency space and not other spaces (i.e., alias, references to Lions, etc.). Incidentally, Lee, Leo, Leigh, Li – some of which share the same pronunciation – are used in literature and elsewhere to depict lions, etc. (Leo the Lion, for example). Some of the young women indicted depict themselves in anime-style drawings on Facebook (Jasminka Ramic) or other wise enjoy anime and like goofy pictures with cats – not all that uncommon from types that frequent the message boards, forums, and social media zones enjoyed by digital currency enthusiasts. To be clear, I am not saying that what I’m seeing with regards to user names, lions, etc. in the digital currency space is ISIS or other terrorist group – I’m mainly discussing possible communication and chatter between some group of people – could be silly, harmless computer geeks for all I know. Additionally, its important to note that today’s indictment potentially produces nothing more than more confirmation bias for my thinking about certain variables in the digital currency space. Side note: it is interesting, however, PayPal and Western Union were specifically discussed whereas the “other means” are not. The broader point, and why I’m sharing now, is to reiterate a need for internet users, especially bitcoiners and the like, to embrace due diligence, questioning, and critical thinking as part of their participation in the ecosystem. Be observant in the digital currency social circles, in particular when using social media. If you see something, say something. Report it to law enforcement. As it happens, this article is a good segue for revealing that WatchDoge has acquired the domain Moolah.ch. You might recall, up until the middle of last spring, Ryan Kennedy (which may not even be his real name, more on that later) used the domain as the face of his business, MooPay Ltd.
Map: Flow of foreign fighters to Syria. Gene Thorp and Swati Sharma. The Washington Post. Published on January 27, 2015. Since the March for Homes at the end of January, parts of the Aylesbury Estate in Southwark have been occupied against the destruction of the estate and attenpts to gentrify the area. Once, when I was an adolescent, I was walking a dog around the neighbourhood. It was a cousin’s dog, they had gone away and left it to us to look after in the meantime. It was dusk, and I enjoyed the stroll around the block as it gave me time to think, even if the neighbourhood wasn’t much more than a hotchpotch of run down red brick terraces in rows and mundane semis. Sink estates like this were dotted around the periphery of the city, the air was equal parts menace and tedium. Some houses were completely derelict, the windows and doors covered by sheets of MDF plywood or corrugated iron frames. There was the odd small front garden with a few flowers in it, although it was far more common to see tufts of overgrown grass and weeds. Some decorated the space in front of their houses with a rusted washing machine. It was not much to look at. I was chewing some gum as I often did, and as I expended its utility the time came to dispose of it. Rather than simply throw it down on the ground as was the custom there, I thought I might make a show of civic pride and put it in a bin. It was the night before collection, so lines of wheelie bins sat on the pavement all along the streets. Seeing nothing more suited as I walked along, I disposed of my gum in a random bin, kept walking and thought little of it, for about ten seconds at least. At this point I heard a voice behind me. Then, as I carried on walking again as he blathered away to himself, I thought about this incident. Why was this man so apoplectic over someone using his bin. It was nothing more than a waste receptacle, his only relation to it was periodically disposing of his rubbish in it before the council sent people to collect it. What difference did it make if it contained a piece of chewing gum that he had not himself chewed? It was this that got me thinking seriously about property. What is property? Its basis in law appeared self-evident. Everywhere one looked, one saw evidence of how enshrined it was. Houses, cars, the aforementioned rusting washing machines. Everything with its designated owner, the conditions of ownership of inscribed in law, agreed upon and defended by all. For those who devoutly believe in unfettered private property, it seems perfectly logical that everything ought to be owned by someone (as opposed to everyone), generally with the exceptions of the police and the military (to ensure that this state of affairs goes on uninterrupted). In their atomised reality, this is simply the natural of order of things, there will always be those who enjoy the benefits of ownership, and it is their right to so to the detriment of others. These people would make it sound like those who saw limits of private ownership as necessary were intent on collectivising children’s toys on night raids, or requisitioning family heirlooms for storage in a People’s Sentimental Objects Depot. But personal belongings are of no relevance to the management and composition of society in terms of the allocation and distribution of material resources. It is a spurious argument to try and equate the ownership of a water treatment plant that ensures the availability of potable water to a necklace passed on by three generations of women. Opposition to any form of personal belongings is an attempt to demonise opposition to privately owned enterprises as the opinions of people intent on creating a 1984-esque dystopia in which no individuality is permitted. This is utterly facetious and on par with the ‘politics of envy’/’champagne socialists’ dichotomy used to respond to systemic criticism whether from the less fortunate or the more fortunate. Nevertheless, all too often the more dominant strands of anti-capitalist ideologies have acquiesced to the framing of the debate as one between free enterprise and private ownership versus planned economies and state ownership. This is also a red herring designed to induce the stagnation of the imagination. These are not the only options available to us. It is possible to conceive of forms of collective ownership that do not entail state supervision, oversight or control. Take for example the disused washing machine sat rusting in the rain out in front of the house. Is it economical for a neighbourhood of 1000 families to have roughly the same number of washing machines? Would it not be a better use of the resources of society to have a communally owned launderette, in which there are a sufficient number of machines for the community to be able to utilise a machine whenever necessary? Could the machines not be maintained en masse, so that repairs would be streamlined (of course, in such an imagined society planned obsolescence would no longer be a factor, further reducing the burden) by virtue of a single location where all the machines were contained? This is just to consider one example of how a communalist-collectivist idea might manifest in a fashion that makes better use of the limited resources of our environment. One of the great challenges to emancipatory and liberatory modes of thinking that reject the state as an entity which can bring about freedom, autonomy and equity is the question of how vast and complex operations like hospitals and electricity production can be administered. It is not my contention that centralised control is essential, but the kinds of structure and organisation that could guarantee provision need to be trialled out. It is quite possible that different regions will require different approaches and different structures based upon their set of conditions. But to insist that private property is the condition of freedom looks increasing ridiculous in the face of the deprivation endured by billions of people around the world, whilst others reside in enclaves of opulent luxury. This state of affairs in not sustainable, and must be challenged. Successful counter examples are the only viable way in which people can be made aware of other ways of operating, and that the idea that they are what they own is nothing more than divisive psychological manipulation designed to ensure consent and conformity. What Baghdadi has done is fuse the political Islamists’ aim of seizing power with the neo-traditionalists’ more global vision. Just under a decade ago, a battered militant group then known as al-Qaida in Iraq decided it needed rebranding. A new structure and name were introduced to a sceptical public. The formation of the Islamic State of Iraq, complete with designated ministers, was announced. The ISI’s leaders lacked credibility and its supposed administrative structure lacked substance. That the “state” in the title was nothing more than an aspiration was clear to all. But the scepticism with which the ambitious name was once greeted is now looking misplaced. The ISI eventually evolved into the Islamic State, which now controls a swath of land from western Syria to western Iraq running religious schools, bakeries and power plants, exporting oil, levying taxes and organising parades of tanks, a potent overseas outreach operation and fighting a war on several fronts. The declaration by Abu Bakr al-Baghdadi, the leader of this new entity, that he is the supreme authority of a new “caliphate” makes it easy to portray the Islamic State as a reactionary throwback. But this is an error. Baghdadi’s vision is profoundly contemporary. It is also a radical break with the strategic vision of previous militant leaders. Political Islamists such as the Muslim Brotherhood and their offshoots have long talked of appropriating institutions and power, by a variety of means ranging from peaceful social activism to a violent coup d’etat, but never about creating a new state. Neo-traditionalists of the Salafi strand of hardline Islam have tended to see the modern state as anathema, an irreligious innovation that has divided the world’s Muslim community. When confronted with the necessity of actually running a state, the response is a mix of bewilderment and incompetence. Seventh-century scriptures are no substitute for administrative or technological expertise, as I witnessed when reporting from Taliban-controlled Afghanistan in the 1990s. A slogan daubed on the wall of one ministry read: “Throw reason to the dogs. It stinks of corruption.” A catchy phrase, perhaps, but not particularly useful when setting up a sanitation system, finding cash to pay civil servants or maintaining order. Osama bin Laden often spoke of a caliphate, a single politically and religiously united realm covering the extent of the Islamic empire at its height. But beyond the mobilisation and radicalisation of hundreds of millions of Muslims through a campaign of spectacular violence, he offered no real strategy as to how the new caliphate might be created or governed. It was understood to be a distant aspiration, not a concrete midterm goal. What Baghdadi has done is fuse the political Islamists’ aim of seizing state power with the neo-traditionalists’ more global vision to create a recognisable if rough-edged state that is simultaneously supposed to be a launchpad for greater expansion. This unprecedented combination is a powerful one. Optimists hope – and they may well eventually be proved right – that the new Islamic State rests on very flimsy foundations. Their expansion has been extremely rapid, they say, and will overstretch resources that are slimmer than they appear from overseas. Isis’s extreme violence and rigorous conservative value system will alienate local communities, they argue, and their avowed ambitions will provoke a regional and international response that will eventually weaken and destroy them. Some point to the example of the Taliban, ousted after al-Qaida launched strikes against the US from Afghanistan about which the movement’s leaders knew virtually nothing. Others cite the reaction against al-Qaida in Iraq in the west of that country in 2005 and 2006, when Sunni tribes turned against Baghdadi’s predecessors on account of their violence, insensitivity and lack of respect for local vested interests. Yet Syria and Iraq today constitute an immeasurably more complex operational environment than Afghanistan did in 2001 and the Awakening fighters who took on al-Qaida could do so because the US army was there to provide protective firepower. Anyone trying something similar in ar-Raqqa or Mosul right now would not last long. Even the Taliban, which clearly benefited, too, from very specific local circumstances, might well have maintained their grip on much of Afghanistan for a much longer period were it not for the adventurism of al-Qaida. Though very different from Isis in many ways, Hamas and Hezbollah, both organisations that have combined non-violent social and religious activism with violence and which, in part or entirely, are considered terrorist groups by many powers, have survived for three decades. There is a further reason to fear Isis may be a more durable construction than some hope. A decade and a half ago the contrast between the capabilities and structure of an organisation such as Baghdadi’s and states in the Middle East would have been dramatic. Militant activity in Iraq or Syria was small scale, fleeting and mercilessly tracked by dictators. Now, in the context of the Syrian civil war and a destabilised Iraq, as well as a regional context of ferment and change, the gap between informal and formal powers in the Middle East is narrower than before. The leader of Isis has a few million fractious people of differing tribes and communities to rule. His main immediate focus is security and military operations. He has a shadowy range of overseas backers and is caught in a broader regional struggle for power. Almost incomprehensible brutality is an integral element of his way of exercising power, terrorising opponents and attracting supporters. 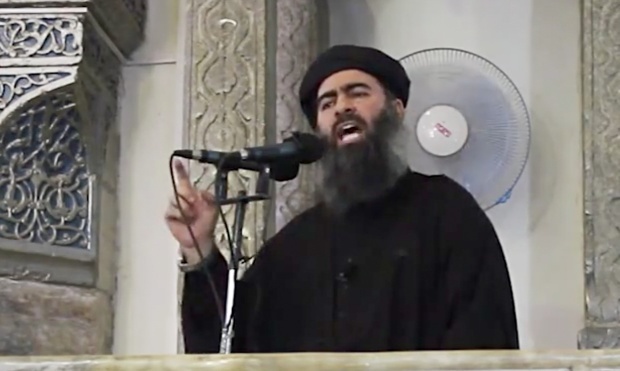 If Baghdadi’s new state were an anachronism, it would pose little threat. It is not, however. It is, tragically, very much of its time and place and much stronger for it.